Raising a teenager is not an easy job! While on one hand, you wish to respect their boundaries and give freedom to grow, make mistakes and learn from them. On the other hand, you want the control and everything under your power to protect your child from the big bad world. When it comes to safety, online media especially social media is a major concern. This is because it has its own unique sets of issues and risks, which can go far beyond online predator horror stories. Because of this, it is important for a parent to be in sync with the teen while using social media. This not only helps you in understanding social media rules but also helps you to get the most out of social media(for both yourself and your child). Apart from this, there are several others reasons to use social media if you have a teenage kid. Dr. Promilla Butani with her years of experience as a child specialist knows just what to do in a situation like these. This post prepared under her guidance sheds light on why parents need to use social media. To Develop an Open-Communication Platform: Platforms like Facebook, Instagram, SnapChat are excellent platforms for open-communication. This just not only helps in breaking the ice between you and your child but, also helps you as well as your child to discuss feelings, share concerns, and unwind curiosity. By using these social media platforms, you get to know how your child behaves and your child gets to see how you are going to react. To Show Flexibility and Reduce Communication Gap: Generally, teenage feel shy and insecure in discussing certain aspects of their life. Thus, by seeing your openness and flexibility on social sites, their fear of punishment and rebellious behavior reduces, and consequently, communication gap decreases. It helps the child understand that they can talk anything to you. In addition to this, it also builds understanding and respect for each other. To Set Boundaries: Looking at the statistics, it is easy to say that teenagers love to spend more time in the cyber world in comparison to the real world. Thus, if you and your child are on the same platform, you can easily apply rules, boundaries, and guidelines for them. This, as a result, helps them to reconnect with the world which they had otherwise excluded from their lives. To Help them Distinguish Between Right or Wrong: Social media is not a fairy tale story. While there are several benefits of being on social media, we cannot deny the fact that it also contains inappropriate content such as sexual or violent comments and embarrassing or provocative images. By being with them on the same page, you not only get to know what they are seeing but can also help them understand and judge what is right or wrong. Adding to this, you can also protect them from cyberbullying. 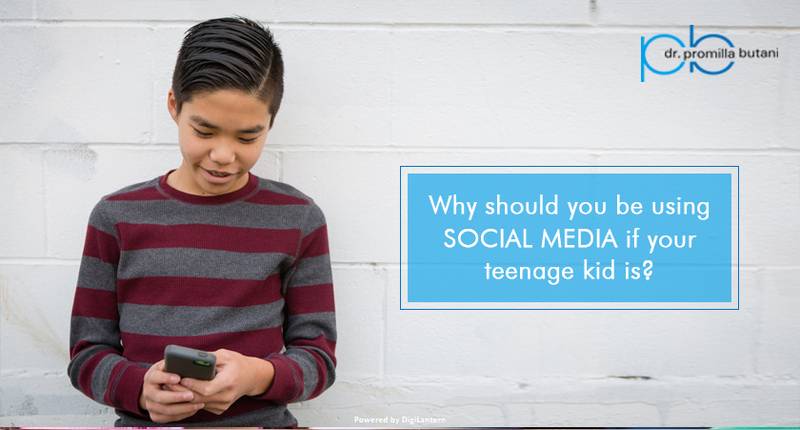 To Help Them Understand Digital Footprint: By being active on social media with them, you can easily keep a tab of what they are posting, uploading, and how it is going to impact them later in life. In short, you can help them manage their digital footprint by revealing its pros and cons. We hope that by now, you must have understood the importance of you being active on social media as a parent. However, if you still have any queries and concern, feel free to get in touch with us at info@drpromillabutani.com. We will be happy to help you!